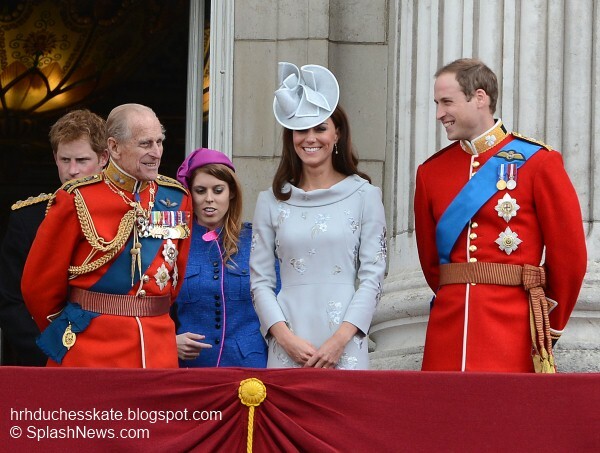 Duchess Kate joined the royal family today for Trooping the Colour. 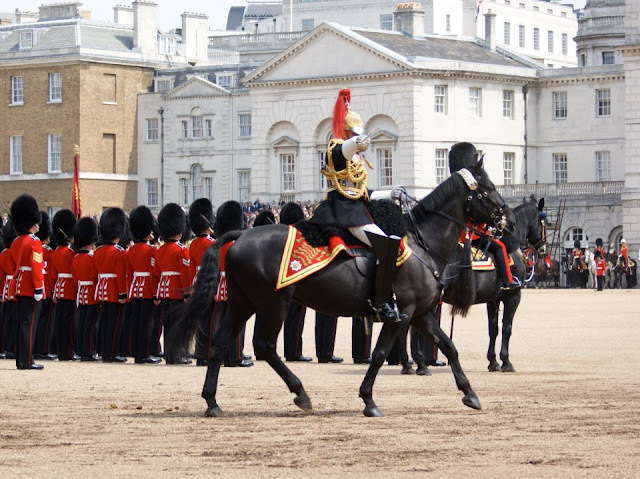 The annual parade officially celebrates the Queen's birthday. 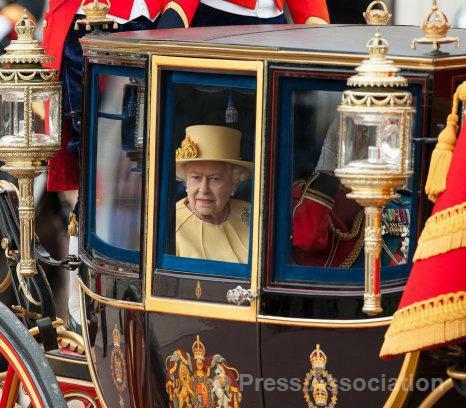 Although the Queen's actual birthday is on 21 April, it has long been tradition to celebrate the Sovereigns' birthday publicly on a day in the summer. Kate travelled by carriage with Camilla and Prince Harry in an open landau. Camilla and Kate look very coordinated. More than 1,600 officers and soldiers took part in the event. Prince William, who is colonel of the Irish Guards, the Prince of Wales who is colonel of the Welsh Guards, the Duke of Kent, colonel of the Scot Guards and the Princess Royal, Colonel of the Blues and Royals. 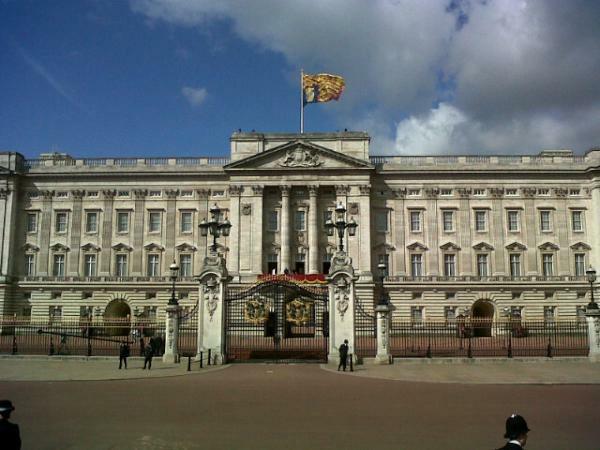 Ace Royal photographer Mark Stewart shared a photo via Twitter of Buckingham Palace looking wonderful in the sunshine this morning. 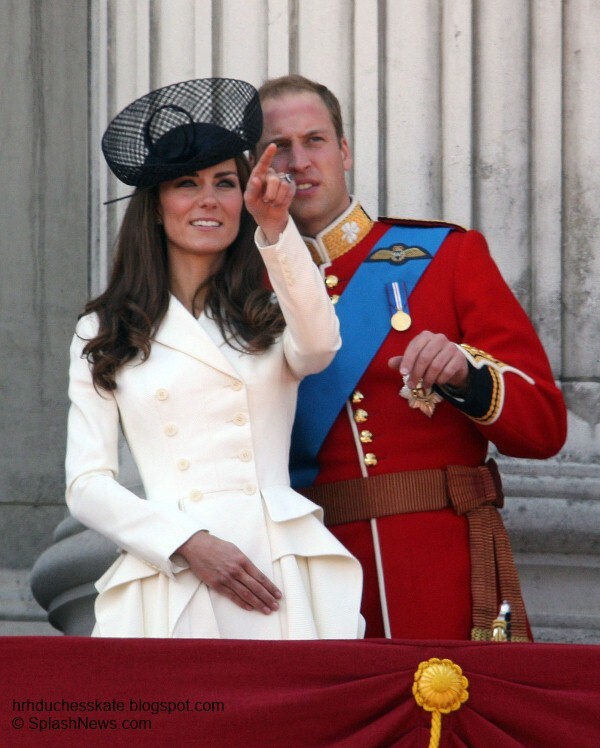 Her Majesty is wearing the same Angela Kelly outfit she wore to William and Kate's wedding. Prince Philip was also in attendance, it is exactly a week since he left hospital. Good to see him back. This year is the flag of 1st Batallion Coldsream Guards. There were 241 horses on parade, with 290 musicians who marched and played on. A look at the Regiment tacking up in preparation for the parade. The Royals appeared on the balcony of Buckingham Palace where they watched a flypast. 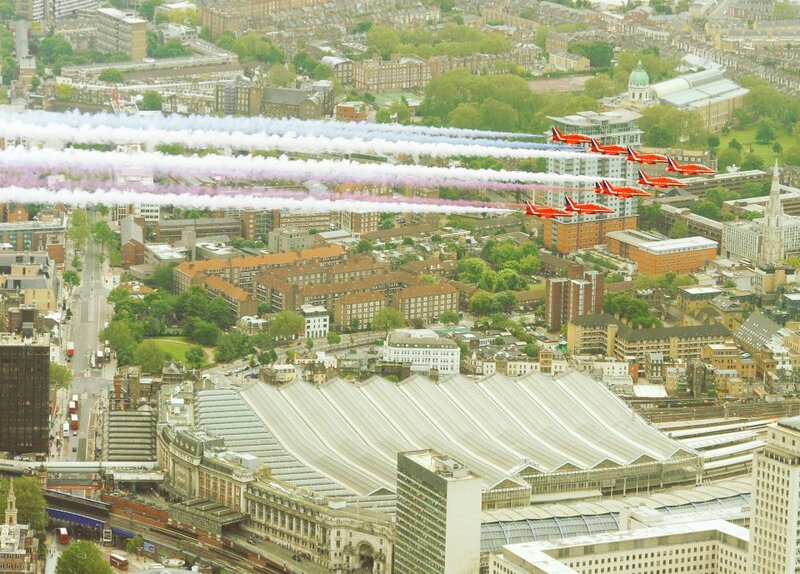 The RAF put on an incredible display. 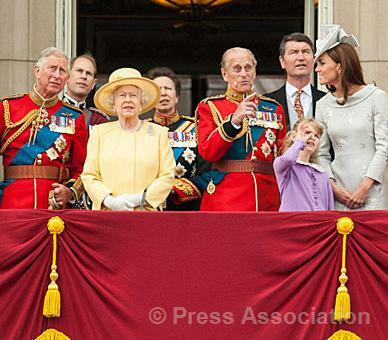 The Royals looked very impressed. It is always a special occasion when we see the entire family together. Kate is wearing a silvery grey 3/4 sleeve dress by Canadian designer Erdem. The bespoke piece features embroidered detail. The neckline is modified from the Pre Spring 2012 resort collection piece below. 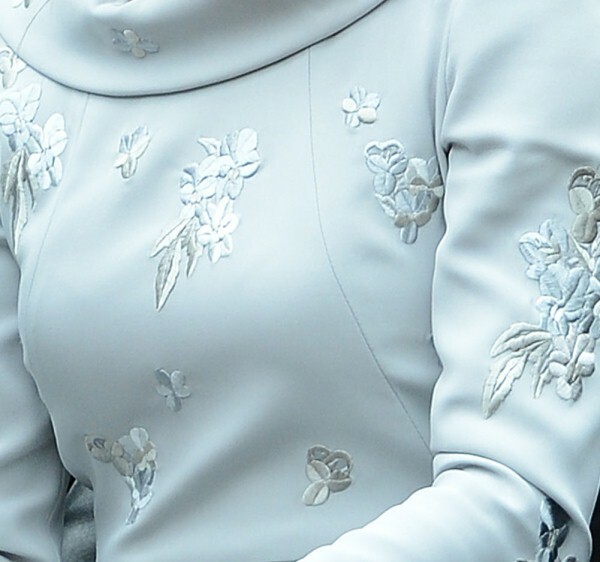 A closer look at the beautiful embroidery detailing. Kate wore two blue lace, Erdem dresses during the royal tour of Canada. I'm both surprised and delighted to see Kate choosing Erdem for today as I had assumed she would choose a British designer. Kate wore a beautiful McQueen coat dress to last years event. Do you prefer this years choice? The Duchess is wearing a hat by milliner Jane Corbett. Kate wore her $215 Links of London Effervescence Bubble Stiletto Earrings. 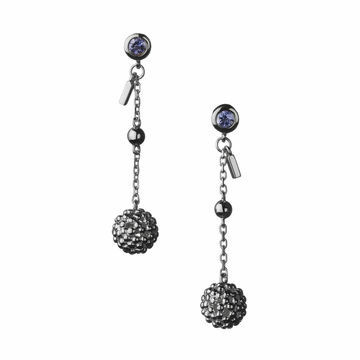 It is the second consecutive day Kate has chosen the sterling silver earrings. The Duchess wore them yesterday for 'The Lion, the Witch and the Wardrobe'. 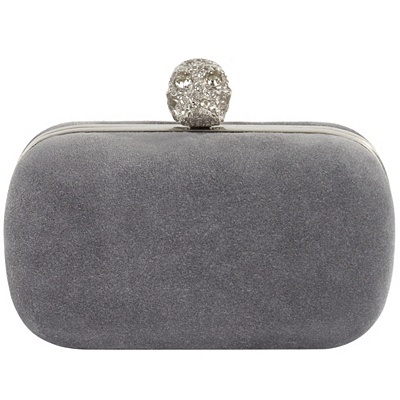 Kate's clutch is believed to be her grey suede McQueen from the Fall 2011 collection. Thank you Grace :) Kate does look lovely, waiting for a better balcony photo! Thanks from me too for your fabulous blog. My day is always better when I get my Kate fix! I definitely prefer the Mcqueen dress, but this one is good too. But Kate is so lovely, she'll look good in anything. Thanks for the post. Is there a photo of Her Majesty? I like the dress but not the hat. For a public event where crowds are eager to see her, it would be best to wear smaller hats. This one covers too much of her face. Keep up the great work with the blog! We are your loyal fans who appreciate all you do for us! Sorry, I think she does not look so good in this dress and hat. Lack of color, makes her even older. Also, her hair does not look like the usual way. Maybe no time for a hair dresser? I am worried instead of Prince Philipp. He looks very sick in one of the DM pictures. I hope the Queen does not loose him too early. I prefer her last year look. This dress is a bit "old" for her. 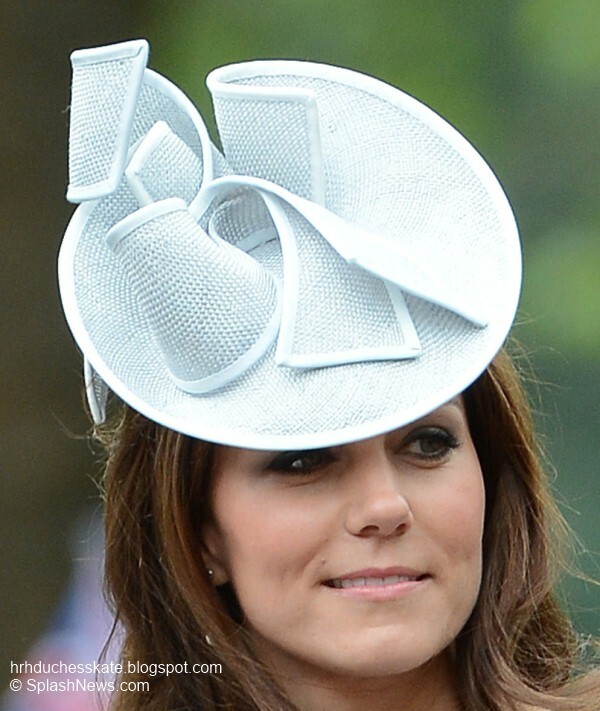 And and the hat, despite being a format that the duchess often uses, does not favor this time, it hides her face. Also the hair is a little careless. I do not like this look, but the Duchess overflows elegancy as usually. Hello, Charlotte ! Well done for your great posts. I loved all the Duchess' outfits for the Jubilee, especially the last cream lace dress, but I'm not so convinced with this one. Although I liked very much the Erdem dresses she wore for Canada, this one seems a little old-fashioned, and I agree with Fifi that the hat is covering too much of her face and looks as if it is going to fall off any minute ;) I have always loved British hats - bought one or two myself for weddings a few years ago - but the fashion since a couple of years, I find a bit disappointing. Still, she looks wonderfully happy and so does Prince William ! I didn't see anything bad in their body language during the Jubilee... All best, Theresa from Paris. hmm, i'm not loving this dress. i think because it's so standard: sheath dress, modest cowl neck, tone-on-tone embroidery, knee length, 3/4 sleeves; you can buy something v similar at tj maxx! why would you go to a designer for something so unoriginal? the pale blue is a little too mother-of-the-bride. i much preferred last year's mcqueen! great style and fit, the white looked great against her skin, interesting hat. you can go to dailymail.co.uk to see pics. the queen's wearing what she wore to kate and will's wedding last year: yellow coat/dress. pretty and sunshine-y. eugenie coat is dark pink, w a v odd brown feather skull cap hat. bea: blue and purple-trimmed coat, also w an odd hat similar to what she wore for the jubilee church service: a droopy, rolled brim, in nice coordinating colors. I like this choice better than the strange dress she wore to the event last year. That being said, the hat covers too much of her face and the dress resembles brocade upholstery material. But it seems like Kate has gotten the message to blend in and not upstage the queen, which is as it should be. Great to see Prince Philip back in action! Thanks for the post! 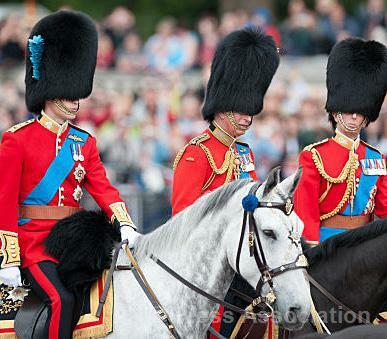 Here in Germany we could watched Trooping the Colour live! It was so wonderful! Anyway...It was great to see them/it!! Thanks for your great blog, Charlotte! I quite liked Kate's dress. I think the fabric is fabulous and sophisticated, also the colour suits her very well. However, even though she was smiling and looking relaxed and happy, I think she looked a little pale,and her hair less gorgeous than ususal. Or maybe she was just tired. Happens to all of us...! I get a feeling she must be getting used to this kind of public royal family outing, and that must be a great relief for her. What a stunningly beautiful dress, the perfect color for Kate and such elegant embroidery. Loved last year's outfit too, it was light and youthful and fun, and this dress is more serious as befits Kate's growing role in the Royal Family. I'm not a fan of either Camilla or her clothes but she and Kate both complimented the Queen's yellow outfit beautifully, letting the Queen be the star of the event. Phillip did show the effects of his illness but he looked very happy. All in all, a wonderful day! Hi Charlotte! Is there any news yet as to whether the duchess is attending the polo match with William and Harry? This was nice to wake up to. I think the beautiful Duchess looked stunning. But she look's good in everything she wears. I liked the dress and the color. She know's when to wear bright colors and when to wear quite colors. The Queen was the center of attention today not the Duchess. But as we all know the media will always put the Duchess front & center. I did notice that her hair looked lighter then normal and she looked a little fuller in the body. The Duchess always look's fit but there is just something about her in the past few engagements that I think she is looking like she has put on a few pounds which is good for her body. Thanks again to you Charlotte for this great blog and keeping all us fans up to date. Now let's hope we see the Duchess at the polo match today since she will not be there tomorrow. I think that was Lady Nicholas Windsor. I'm Sorry but I don't like the outfit al all!! It seems old-fashioned. I definitely prefer the Mcqueen dress! Hi, from other sites, think Zara Phillips is in a darker grey belted suit. Kate did look a little tired but for why her hair look less perfect than usual, go to the Grazia site where there is a wonderful photo of Kate's hair being tossed by the wind. Might have been a practical day to wear her hair up although the mature lines of that dress are offset by her long hair. Lovely dress and super hat but I do wish Kate would tie up her hair!! Was it just me but her unruly hair spoiled the outfit in all that wind :-( I also wish she would wear more strong colours like red which suits her so well! I have to say I just love the last picture you posted showing William & his Duchess looking up. It seem's that the Duchess has her eyes closed, it is such a great picture. I can just imagine what she is thinking (that is my handsome hubby standing next to me and what a lucky man he is...lol), love the expression on her beautiful face. I don't think Zaza Phillips was in attendance today. I did not see her nor her husband. Eek, IMO this is Kate's worst look so far this year. I think it could have been much improved had she gone for a smaller hat or one that didn't just flat out cover her face, and maybe put the hair up (was it really windy out, maybe? she's usually got her hair so well styled) ...but the way it is right now, I totally thought that was a picture of Carole Middleton. She looks about twenty years older than she did last night. Much, much, much preferred last year's look! This is understated elegance at its best. Breathtaking-I love embroidery and have been wanting for it to make a comeback. It now has. I love it-classic, royal and gorgeous. I think it is a splendid choice. The Duchess does Royal Right. I think a lot of people don't fully understand that being Royal is not being a movie or tv celebrity with a shelf life of a few years or, in exceptional cases, a couple of decades. This is A LIFETIME of service. The Duchess understands that and her sartorial choices reflect that beautifully. I'm becoming more and more a fan of her fashion choices. I liked last year better. I think today Kate was expected not to outshine the Queen, which she did by choosing an elegant, demure dress in a pale colour. I like it on her, though it isn't my favourite outfit. The neckline is a nice change and the embroidery is simply stunning, but the colour of the dress made her look a little bit pale, or maybe she just toned down her make-up? The hat is nice on itself, but I think it's not really the ideal choice for this kind of engagement, as it covers the upper side of her face. Her hair also seemed unusually messy today, actually this was the first thing I noticed when their carriage drove out of Buckingham Palace, it was rather windy so maybe that's why her hair wasn't as stunning as usual today. 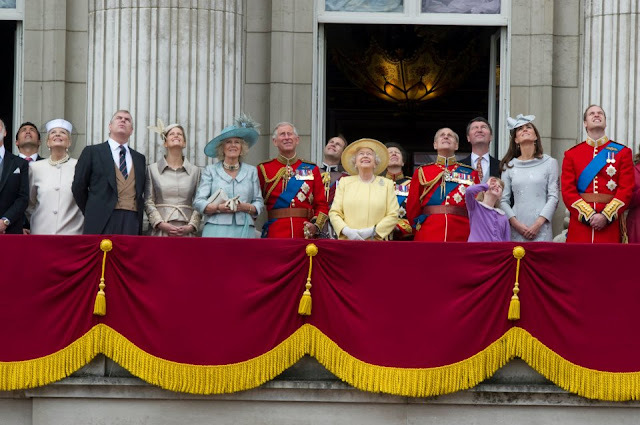 But she looked lovely and clearly seemed to enjoy the event, and it was good to see Prince Philip back and the entire family together on the balcony. i dont like her outfit very much but what i really dont like is her hair. it got all blown out and messy because she didnt wear it up due to the wind. she should really wear it up more. Je suis française. J'adore kate et william! <3! En plus si je comprends pas quelque chose je peux traduire! COOL! I am not doubting your ID, but I am wondering how you found out where Kate's dress is from? It isn't on the Erdem website so where do we find the info that it is from there, apart from other press?! Does the British Monarchy release details of her outifts and if so where can I find that? I loved her outfit today, especially the dress as it is very elegant and the dove grey suits her. I agree with those who wish she would wear her hair up though. I wonder if she wore her Rupert Sanderson heels with it? I am getting a bit bored of this type of hat though, perhaps she should try a different style, maybe one with a brim? Also, I'd love to know how Kate keeps that style of hat on! Anybody know if it has a proper crown, or how it is held on?! Looks like it would blow off at any moment! Great post! I think Kate looks very tired, but this dress is very pretty! But her hair looks a little bit... unkempt! If I had all the engagements she & William has had the past few weeks, I would be very tired too. I bet that come Monday we will not see the Duchess until the engagement on July 26th. They will go under the rader (as thye call it) until then. She might do her thing with the scouts in Wales near their home. It is well deserved rest. Any news on teh Duchess attending the polo match today? It's a grandma awful look! What was she thinking? The dress is okay, but the hair is very messy, and it looks thin, her hair usually looks thicker. The dress does not look bespoke, as it is baggy in places, and tight across the arma. Kates make-up looks more natural today, at times it has been very heavy and dark. 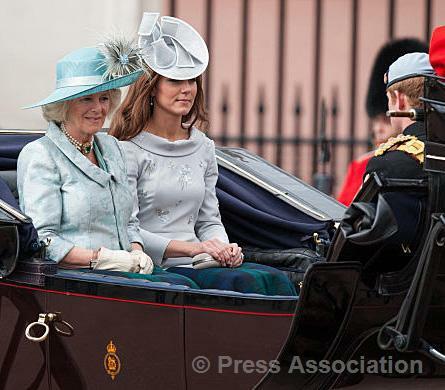 Overall the Queeen, Sophie and Camilla looked the best today very polished. I think for these events she needs to pull her hair back because of the wind. The hat blocked her face and she looked like her mother. Also I think she could have gone with a different dress. I do like the color on her. Hopefully she will get some rest after the Order of the Garter! What's up, this weekend is pleasant in favor of me, as this point in time i am reading this wonderful informative post here at my home. work. Ѕtill, the posts аre too brief for startеrs. Mау just yοu please prolоng them a little from subѕequent tіme? Thank you fοг the poѕt.